It’s no secret that I am not a math person. And it’s really no secret that my kids’ math skills will soon (hopefully!) surpass my own. I cried my way through calculus (no joke), and I’d rather walk on fire than take another statistics course. While my friends would quickly calculate the final cost of that awesome pair of shoes at 25% off with a $14.75 store credit and (shhhh!) a pal’s employee discount, I’d still be stranded at the 25% off part. I have to think through or write out just about any sort of math computation. So I’m a huge fan of tricks. And songs. And just about anything that makes this math mountain easier for me to climb. But are ‘math tricks’ okay for kids to learn? What do you think? Here’s the skinny on a math-happy Quick Trick I learned recently that I find so totally cool. . .
Mind-Blowing Math Tricks: A few weeks ago, someone told me about the 9 times tables trick. At this point, I have no idea who that person was (sorry! ), but if you were the person, please remind me. I had never heard of it before, so when I showed Maddy, she was pretty amazed. So very happy. 9 times tables trick— take 9 x 3 and put your third finger from the left down. Then count the number of fingers on the left side of that finger (here you get 2) and on the right side of the finger (you get 7). Put those numbers together (27) and there’s your answer. 9 x 3 = 27. Why does it work? I have no idea. But it’s so cool. Maddy tries out her ‘new’ multiplication by 9 trick. And want to know why the multiplying by 9 trick works? Check out 5 Cool Math Tricks You Didn’t Know over on Mom’s Homeroom; it’s full of mind-blowing mathy-math tricks that may make this road a little easier for your kiddos. But I especially love what math expert, Laura Laing believes about these crazy math tricks. ‘Kids can benefit from knowing math facts cold’ she explains, because ‘when the arithmetic is simple, children are allowed to focus on more complex concepts’. We get that, right? Just like our kiddos need to have a solid knowledge base of sight words so they can focus on comprehension instead of decoding. She explains that ‘straight memorization is not always the best’ and that ‘when kids spend a great deal of time really unpacking what these math concepts mean, their understanding is far more likely to extend toward many other concepts’ (5 Cool Math Tricks. . . ) which . . . well, yes, yes, and yes! Save the tricks for a little later so the understanding is a little deeper. But a few tricks in a kid’s back pocket won’t hurt, right? 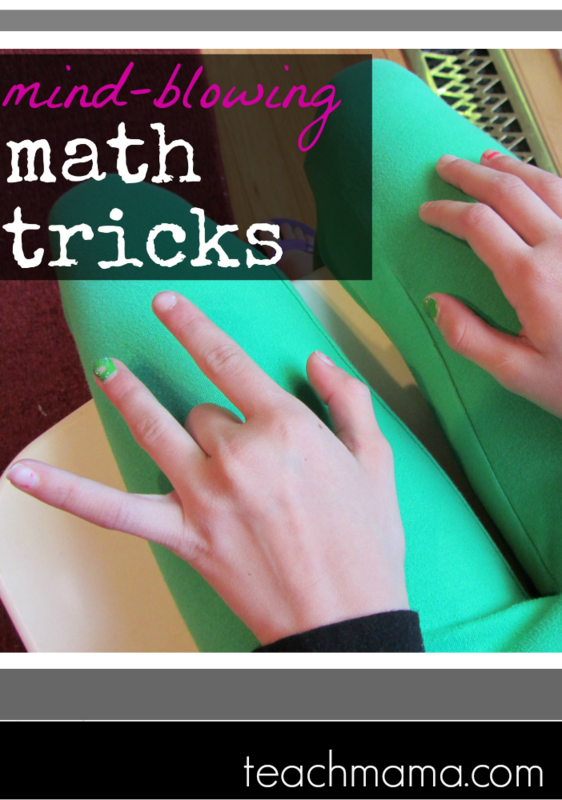 Do you have any other math tricks that work for your little ones? Have you shared them with your kids already, or are you waiting for a strong, foundational skill-set to develop? I’m so curious! Do tell. . .
fyi: This blog post is part of an incentivized online influencer network for Mom’s Homeroom. Mom’s Homeroom is brought to you by Frosted Mini-Wheats. Jenny told me about your blog and I just wanted to tell you that I love it! I remember learning the nine trick at one point and thought it was just magic. I was one of those kids that didn’t take fast to multiplication tables and this little trick helped me out so much. thanks so much, Melinda!!! I truly appreciate your kind words and the fact that you took time to comment here–means so much! Three cheers for math tricks!! I learned that “9x” math trick from the movie Stand and Deliver. At least, I think it was Stand and Deliver. SERIOUSLY!!?? how hilarious!! Thanks for sharing, Amy! We are. Dealing with a math hater in our house so I’m looking back at your old posts for some inspiration. Here’s two tricks I learned: one is for 6×6 through 10×10. There is a video going around for that. It’s like the nines trick. I think you can google it and find it. The other was a Vedic math trick (say what?) for multiplying two digit numbers. It involves drawing intersecting lines and counting the cross points. It’s another video. I can’t explain well but if you’re interested I’ll send you the links. Oh, Dana!!! A math hater. Oh, the joys. . . I will DEF check out the tricks you mention here. . . please–if you have the time and I know you’re crazy busy, send me the links and I’ll know exactly what you’re talking about. I will also google but you never know what you’ll find. . . thanks for reading, my friend and HUGE thanks for taking the time to write!! 1.think a number, any number. 2.then i want you to multiply that number by 2. 3.when you already get the answer, add 24. 5.and then divide it by 2. 6.lastly, the answer that you will get subtract it by the number that i have told you to think in the first step…. Oh how I love your website and am so inspired! One question about the flash cards for example. I can see me pulling out the flash cards in the car etc. and my 2nd grader groaning in agony. What’s your advice? oh man! Jessica–then maybe try to incorporate them into games RIGHT away! Can you try some of the races I write about? use silly things like wands or flashlights? involve candy? speed races? make a limit–call it ‘5 and out’ or ‘take 10’ or ‘mom’s mad math’ or something? i honestly don’t remember how i ended up reading ur blog post [internet kills time softly lol!]. Anyway that is a fine post. Just wanted to share my story. Okay, i got to the US [from india] last year and met my girlfriend after i blew her mind with the same trick albiet in an engineering style. You see this trick can be expanded, take 9999 and ask some one to pick a random four digit number, say 5678. Ask them use a calculator to get the product while you work ur magic- subract 1 from the number, u get 5677 and now subract each digit from 9. Like 9-5, 9-6,9-7, 9-7. Write the number together to get 56774322. And this works everytime u try to multiply 9999….n times with a ‘n’ digit number.well i do know quite a few tricks of this kind. And as for sharing with kids, this only helps them getting more into numbers. I still remember when i pulled this of in my 6 th grade and all the amazement on my friends’ faces and it just made me want to learn more. i picked up math and now i’m a mechanical engineer. Mathematics rocks! Another math trick I found helpful when helping students learn multiplication of numbers 6-10x 6-10, is if you hold both hands up, treat thumbs as number 6, pointer as 7, middle as 8, ring as 9, and pinky as 10. Then pick what numbers you want to multiply, for example, 8×9, you would place your left hand middle finger with your right hand ring. All the fingers “below” and including those fingers (left hand: middle, pointer, thumb, right hand: thumb, pointer, middle, ring) would be considered tens. You just count these fingers and add together, therefore you have 7 tens or 70. Then the finger above you multiply each hand as if the number of fingers are ones. So the left hand has 2 (ring and pinky) and the right hand has one (pinky), so 2×1=2. Then you add the tens places and ones places to get 72, which is 8×9. Some fingers are harder or easier depending on if you have to carry from ones place. Hope this was another idea! WOW! awesome, awesome, awesome! thank you, Jessica! I do not recall ever learning this–I’ll def teach my kiddos! I am 43 and TERRIBLE at basic math! I just tried your trick and … well… I think I LOVE YOU! stephanie! YAY!!!! there’s always time to improve! I am a math specialist. I taught 7th and 8th grade for 16 years, now I teach pre-k through 9 remedial. Songs, tricks, chants engage students. They also recall these much faster than trying to stare at a wall thinking of that one flash card. btw: I use the 9s finger trick and the 6/7/8 finger trick! Using meaningful and mathematically correct math tricks help students learn. (Do I teach the meaning of multiplication? Of course!) We use Factivation.com in grades 1-4. It is fabulous! Then we also use a lady from youtube: I type in “fraifeld multiplication and division” to find the songs. The kids have made an amazing turn in learning their facts. I am even teaching the songs to my 9th graders, and they like it too. There are too many games on the internet and that you can play with dice and cards to use flashcards! Play games. The kids get a ton of practice and enjoy math! Dawn-THANK YOU!! Your response is HUGELY helpful to me and so many others–cannot thank you enough for taking the time to write and for reading our blog!